Price listed in our website is final and non-negotiable. However, for corporations we do have special rate subject to quantity purchase. Accessories included in the box are as per listed in our advertisement. Please note that we do not provide the connector for certain sets which comes with a 2 pin charger. All shipment of order is made on the same day if payment is made before 4.00pm on Monday-Friday (except for public holiday). However, for no stock item, we will try sending the item within the next 2 working days or refund / replacement will be offered to the buyer on the 3rd day. Good solds are not returnable. If in any situation that customer insists on returning the product within 7 days from the date of purchase, we will charge restocking fee of 20% or more, subject to the item and package condition verify by our technician and sales representatives. Our sales team are not responsible for mis-selection of every item purchased by customer. Customer can consult them for advice but the final decision is on customer responsibility. We can't guarantee the availability of stock at all time due to our stock is moving from time to time from walk in sales, and delivery order. However, we do offer a same day reservation without any deposit. Please call our hotline 0356211355 for reservation. Some sets are not in sealed box condition, and sometimes comes in a sealed box, we will always transparent regarding the status of our set. Please make payment and upload proof of payment (for offline payment method) within 24 hours from the time of order, failing which we reserve the right to reject your order. Payment for all sales /promo items must be made immediately after the order is made. Proof of payment must be either screenshot or picture of original receipt from online banking, cash deposit machine, or bank counter. E-mail confirmation will not be considered as proof of payment. We reserve the right to withhold payment if the transaction appears to be a possible fraud. i.e. Payment made by a third party, and not by the buyer or recipient of the goods. We will lodge a police report in the event that we find the payment is fraud. We will verify the payment and process the order accordingly. If the item(s) customer purchased is not in stock, we will try to post it again on the next day. However, if the item is still not in stock on the 3rd day of the date of purchase, we will inform the customer and offer a replacement / refund subject to the customer agreement. We reserve the right to change the price without prior notice. In the case of our system is being hacked, malfunction or description is inaccurate, we reserve the right to cancel the order and return full amount if payment has been made. To avoid delay in shipping, please do not send the same order to multiple sales people. Deal with 1 sales person or 1 mode of contact: for example, if you order via email, continue to communicate by email. If you order via WhatsApp, continue to communicate via WhatsApp. We only ship within Malaysia only. Free shipping is entitled for selected products only. For PWP (purchase-with-purchase) promo, customer must purchase the item within 7 days from the date of receipt. The promotion is no longer valid after the 7 days period. If customer decide to cancel the order or request a refund on personal justification, we will charge RM20 for admin fee, that will be deducted from the refund amount. Refund process will takes approximately 5 working days to complete. However for credit card purchase, the refund will take approximately 10 - 14 days to complete. Warranty period for local original set is set bythe authorized distributor / manufacturer. 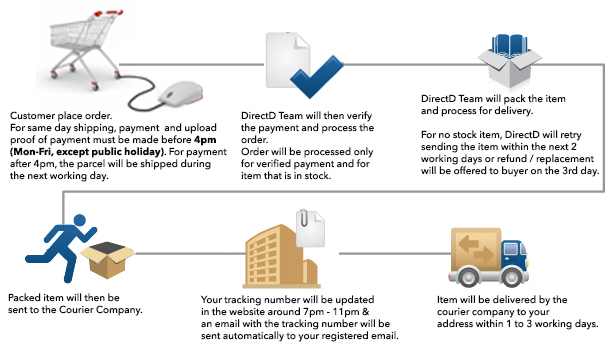 DirectD will not cover the shipping cost or any other cost to send the broken / faulty item to us. Customer also has to pay for return shipment for cancellation of service, and for device that the warranty has been invalidated. However, for device that is eligible for warranty claims, we will bear the shipping cost of sending the device back to customer. For original product purchase from us and in need of warranty, DirectD will assist to send the product to authorize service center. Any negotiation regarding the warranty is between the owner of the device and the service center itself. We do not accept payment via PayPal, local cheque or international TT. We will not be responsible for payment using these method. Click here for DirectD warranty policy. Good solds are not returnable. If in any situation that customer insists on returning the product within 7 days from the date of purchase, we will charge restocking fee of 20% or more, subject to phone and package condition verify by our technician and sales representatives. We will try our utmost best to deliver the goods on the agreed date. However, if we are unable to do so, you will be notified and an alternative date will be arranged. Your order will be delivered at the agreed time and location. You must be available to sign a personal acknowledgement of delivery. We strongly recommend that, upon receipt, you inspect the phone. If the package appears damage, it is advisable that you do not accept it. In the unlikely event that we deliver the wrong phone to you or that it is damaged; please notify us within 24 hours. We will not be liable for any claims after the given 24 hours. If we are unable to provide you with your order due to unforeseen circumstances, you will be contacted as soon as possible and you will be offered a substitute phone of your choice (subject to availability) or a complete refund. Express Nationwide Shipping is provided at just flat RM10 for both West & East Malaysia. Combined shipping to a single address is allowed. All orders with self collect options will be processed between 11am to 9pm from Monday to Sunday. Customer are required to provide full name and ic number of the person intending to collect the product. This will be verified by our sales person during collection. Upon completion of payment, customer are required to wait for our confirmation email before they can proceed to collect the phone. Our turnaround time is 2-4 hours for direct bank in and 4-48 hours for credit card payment. For credit card payment, the bigger the amount, the longer time is needed for verification. Customer are not required to bring any documents during collecting the phone except for IC (Identity card). In the event the person name and IC number is not the same with the provided name and IC number during the online order, we have the rights not to allow the self collect to occur.